We are now only one month away from the end of this year. How quickly time passes! December is always the busiest time of year. Last month, we took part in the IFFT/Interior Lifestyle Living trade fair. 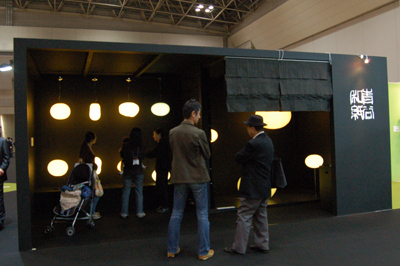 Our exhibition booth for this year's event was a very space-conscious one, with its interior space dimly lit. Shown below is the highlight of this year's exhibit. They may be indiscernible in the photo taken under poor lighting conditions. 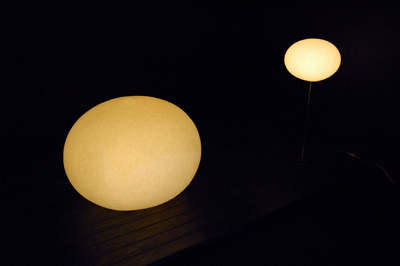 These objects are spherical lampshades that are 800 millimeters in diameter. Some said they looked like the moon, and some said they resembled an egg of a dinosaur. Anyway, the lampshades got a lot of attention. We thank those of you who came to see our booth at this trade fair. 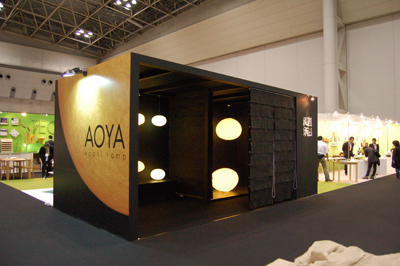 It is our hope that our exhibit contributed to conveying the appeal of seamless three-dimensional washi. We intend to post some photos taken with different background colors later to give you more details.